The 20-year-old, who represented Chiefs and Swallows as a teen, was a pretty serious soccer player before he realised his first love was rugby. Wandi Simelane merely laughed, well, like the excited 20-year-old he is when he was jokingly asked how it feels to have “graduated” from boy wonder to superhero. Admittedly the superhero reference is meant to be tongue-in-cheek given that he’ll be part of the Lions group competing in this weekend’s #SuperHeroSunday pre-season tournament, where the four local Super Rugby franchises will wear Marvel-inspired kits. But the boy wonder tag is pretty serious. There are a lot of hopes being invested in the youngster who grew up in Power Park, Soweto. 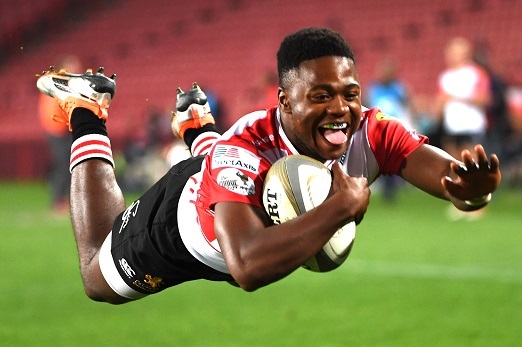 Having represented the Lions at all levels already as well as being the Junior Springboks’ key player in last year’s World Championship, Simelane is widely expected to graduate to Super Rugby in 2019. In fact, some may even hope he makes a similar dramatic impact like teammate Aphiwe Dyantyi though he’s not putting any pressure on himself. “All I basically am at the moment is a sponge,” said Simelane. That easy-going attitude stems from his childhood experiences, where Simelane learned quite early to let things take its course. Considered a talented soccer player, he was a Kaizer Chiefs trialist at age 1o and represented Moroka Swallows’ Under-15 team at the Nike Cup at the behest of his father, Christopher, a stern man who gave his blessing for his eldest son to attend Jeppe Boys High only after promising him to give football one more go. Yet the demands of juggling the two codes became too difficult and Simelane chose rugby. Much like Dyantyi, who also admits to a love for the round ball, Simelane is inspired by the Springbok winger’s success. “Aphiwe hasn’t just inspired his teammates, he’s inspired pretty much most of South Africa,” he said. For now though, the objective for the year is simple. “I was quite happy with my performance last weekend against the Bulls. Even though it was just a warm-up game, the nerves that go with it is out of the way now,” said Simelane.